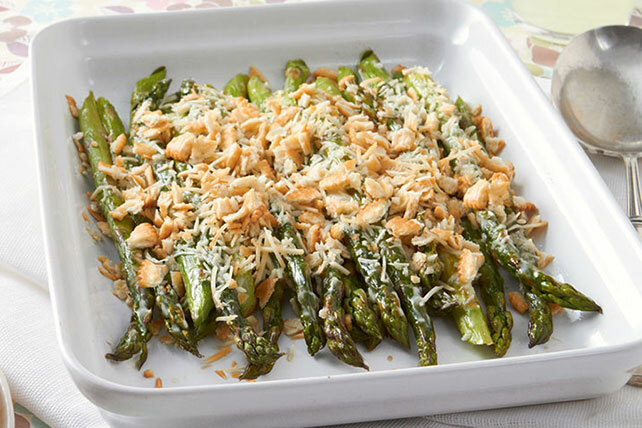 Add elegance to any occasion by making Baked Parmesan Asparagus with a crunchy crumb topping. The Parmesan crunch comes from cheese and crackers. Cook asparagus in simmering water in large skillet 2 to 3 min. or until bright green, but still crisp; drain. Place in shallow baking dish. Save 40 calories and 7-1/2 g fat, including 1 g sat fat, per serving, by preparing with KRAFT Fat Free Ranch Dressing and RITZ Reduced Fat Crackers.